I have owned this vehicle for over 29 years and am only the second owner. During this time this vehicle has been garaged and has not been in snow or rain in over 21 years. 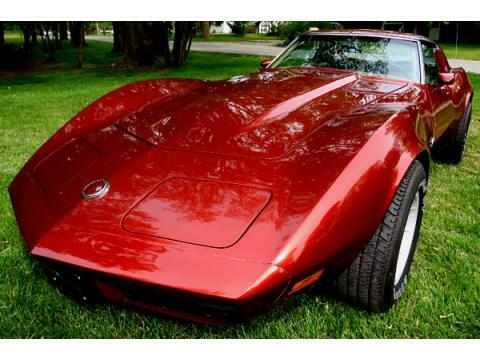 This vehicle is one of just over 4000 L-82 4-speed Coupe Corvettes produced in 1973. VIN# 1Z37T3S409249 Engine# V1122CLR. 1973 Corvette T-top coupe with 112,207 miles: Numbers matching L-82 - 4 speed - 3:55 Posi - tinted glass - Deluxe leather interior - Factory A/C - P/W - P/S - P/B - Tilt/Telescope - Rear Window Defroster - Map Light - Luggage Rack - Pioneer AM/FM Cassette Corvette Radio. Less than 8000 miles on "frame on" body restoration by a professional Corvette body shop. Original white body painted GM medium red. American Racing aluminum wheels with 5000 miles on Goodyear Eagle GT Tires. Also at that time the interior received these new items - dash pad - windshield pillars - Sun visors - deluxe door panels - carpet - seat foam and leather covers. Interior is very good but not restored as there are still some original pieces. I have original seat belt parts for restoration but just lap belts in at this time. Original interior color was changed from dark saddle to medium saddle. Hurst competition plus shifter - Hayes steel flywheel, clutch and pressure plate. 10,000 miles on new Heavy Duty rear leaf spring - differential cover - ball joints - tie rod ends - s/s calipers - s/s park brake kit. 5000 miles on factory rebuilt steering gear box. 0 miles on frame cleaning and painted with end rust protecting paint and also these new parts - Bilstein heavy duty shocks - rotors and pads - s/s park brake cables - s/s brake lines and braided hoses - s/s gas line - drive shaft u-joints - axle shaft u-joints - gas tank sealed and painted - 2 1/2 " aluminized exhaust pipes - Dynomax aluminized performance mufflers with s/s exhaust tips - Dynomax ceramic coated headers. 0 miles on following parts - all A/C parts - A/C compressor - condenser - evaporator - main hose etc - heater core - blower motor - heater hoses - radiator hoses - Be Cool aluminum radiator - Flex A Lite Black Magic electric fan - Aeromotive Fuel filter. 73 L-82 comes stock with 202 heads with push rod guide plates - screw in studs - 4 bolt mains - windage tray - baffled oil pan. Engine was align bored to accept a large journal 400 cid crankshaft to convert to a 383 cid at later date. Numbers matching L-82 has less than 5000 miles on rings - bearings - valve grind job and 0 miles on following parts - Comp Cams Valve springs - Harland Sharp roller rockers - spring retainers and keepers - poly locks - hardened push rods - Crane cam and lifters - Pete Jackson "quiet" timing gears - aluminum timing cover - Weiand Aluminum water pump - Melling oil pump and drive shaft - MSD distributor and coil - Mallory plug wires - March underdrive pulleys - Lokar throttle cable and engine oil dip stick. Induction is a 1988 TPI unit with new Accel 25 lbs injectors - Granatelli adjustable MAF sensor - BBK twin 52mm throttle body - BBK adjustable fuel pressure regulator. Swap was made with a Painless Wiring Harness and Hypertech Thermomaster prom modified for this set up. Engine parts clear powder coated are - manifold - plenum - fuel rails - valve covers - throttle body - water pump - timing gear cover - all pulleys - alternator - water inlet. Black powder coated air runners, A/C, P/S and Alt brackets. Most anything that shines is either polished aluminum or polished stainless steel, very little chrome. The National Auto Dealers Association web site, nadaguides.com, has the car listed with these options priced between $39,000 and $63,000. This does not include the modifications and upgrades listed. Asking price $35,500.